On the Disk Partitioning Setup screen, select Automatically partition. 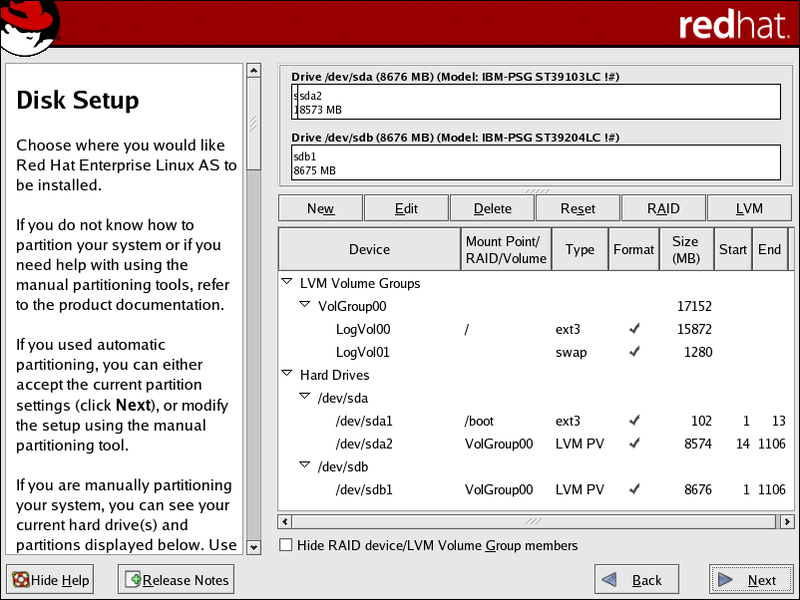 For Red Hat Enterprise Linux, LVM is the default method for disk partitioning. If you do not wish to have LVM implemented, or if you require RAID partitioning, manual disk partitioning through Disk Druid is required. A single LVM volume group (VolGroup00) is created, which spans all selected drives and all remaining space available. In the following example, the remainder of the first drive (/dev/sda2), and the entire second drive (/dev/sdb1) are allocated to the volume group. Two LVM logical volumes (LogVol00 and LogVol01) are created from the newly created spanned volume group. In the following example, the recommended swap space is automatically calculated and assigned to LogVol01, and the remainder is allocated to the root file system, LogVol00. If enabling quotas are of interest to you, it may be best to modify the automatic configuration to include other mount points, such as /home/ or /var/, so that each file system has its own independent quota configuration limits. In most cases, the default automatic LVM partitioning is sufficient, but advanced implementations could warrant modification or manual configuration of the partition tables. If you anticipate future memory upgrades, leaving some free space in the volume group would allow for easy future expansion of the swap space logical volume on the system; in which case, the automatic LVM configuration should be modified to leave available space for future growth.